Join two playful friends in the bath for floating fun! Baby can bat at the hippo and lion on either end to see them flip and hear them rattle. Sized just right for baby to grasp and bat; weighted just right to float and flip! 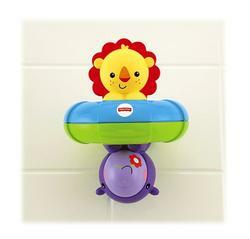 A new friend with every flip makes bath time more fun for baby! Two colourful characters surprise baby at every flip! Bright colours and rattle sounds help stimulate baby?s senses of sight and sound. Water/bath play helps stimulate baby?s tactile sense, too!